Spiritual Crossroads: I Know My Galactic Family is Here, Do You? 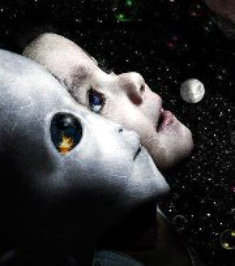 Last Friday, September 14, 2012, the InLight Radio team released the video, I Know My Galactic Family is Here, Do You? The response has been overwhelmingly positive with just under 90,000 YouTube hits in less than a week. The idea of this video was conceived by Steve Beckow roughly two weeks ago, and the InLight Radio team ran with it. It has been a grassroots production in every sense of the word, designed to announce Disclosure by ordinary citizens of earth. It was put together with the help of about 20 volunteers who are committed to getting the word out about our star brothers and sisters, and how they’re here to help humanity and the Earth. The effort continues to get the video out globally. I’m so pleased to report that the audio has been transcribed and is being translated by a team of 38 volunteers on Luisa Vasconcellos’ translation team so the video can be shared with subtitles world wide! We hope to start posting these translated videos on the InLight Radio YouTube channel soon. We put this together without spending a dime, using our own computers, ideas, drive and desire to create an informative and uplifting production. It was a lot of work, and we most certainly learned a lot as none of us are video production experts, yet we’ve achieved our goal in bringing this video to fruition. But we still need your help! We need to continue to get this out! Send this to your friends, family and colleagues. Social media tools such as email, Facebook and Twitter are terrific ways to share this. This is Disclosure, folks. This may be as good as it gets for a while, until the governments fall in line. The more we get the word out about our galactic family and help humanity become more comfortable and excited about their presence, the quicker our star brothers and sisters will make their presence known and assume a greater role in working with us to bring about a wonderful new world! Another great interview from 1958 with Mike Wallace regarding UFO's.